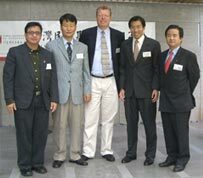 Issues related to the promotion of democracy in the Asian region stood at the center of a series of meetings which Dr. Ronald Meinardus, the Resident Representative of the Friedrich-Naumann-Foundation in the Philippines, attended in Taipei/Taiwan on October 5-6, 2004. Sponsored by the Taiwan Foundation for Democracy (TDF), delegates from NGOs and political party leaders from various Asian countries convened in order to prepare a unified regional NGO strategy to be presented at the “Community of Democracy” (CD) conference in Santiago/Chile in May 2005. CD is a coalition of democratic countries, initiated in 1999 with the common goal of strengthening democratic institutions and values on national, regional and global levels. For the first time, non-governmental organizations have been invited to join this political process of the governments. The regional meeting in Taipei aimed at coming up with coordinated policies on such important issues as how best to fight corruption, how best to promote good governance and how to develop democracy in countries under totalitarian rule. Following the drafting of the position papers for the Santiago conference, the NGO-leaders discussed a new Taiwanese initiative to set up a “World Forum for Democratization in Asia”. Dubbed “WFDA”, this project wishes to coordinate the numerous activities aimed at promoting democracy in the Asian region. According to the organizers, an inaugural event will be held in July 2005 to advance the democratic agenda in the region. Finally, Dr. Ronald Meinardus participated in a strategic workshop aimed at strengthening Democracy Assistance Foundations (DAF) in Asia. This meeting, also, was hosted by the Taiwan Foundation for Democracy. TFD was set up one year ago and remains the sole such institution in the region. While Japan and South Korea have plans to set up DAFs, it became clear in Taipei that these plans are still far from being put into practice. “The eagerness of the Taiwanese friends to assist in spreading and consolidating democracy is very impressive”, said Dr. Meinardus after his talks with TFD-President Dr. Michael Kau in Taipei. “We are all too happy to share our experiences with the colleagues from Taiwan”, Dr. Meinardus added. The liberal Foundation has invited TFD-staff members to visit Manila in the near future so that they may get a first hand impression of how the Friedrich-Naumann-Foundation’s Philippine project operates and cooperates with local political partners in an effort to strengthen democracy in this country.